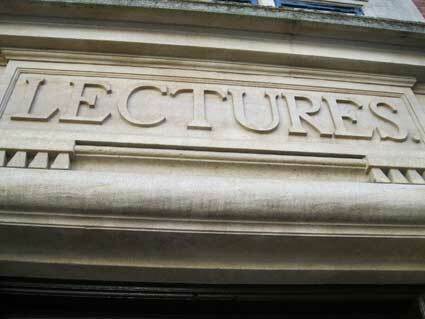 Architectural features fronting public buildings often provide spaces for integral lettering. The most conventional is the Bethesda Baptist Church: a chisel-style sans serif capital letterform ideally suited to the temple-like, columned portico, the pediment supported by four polished granite columns. 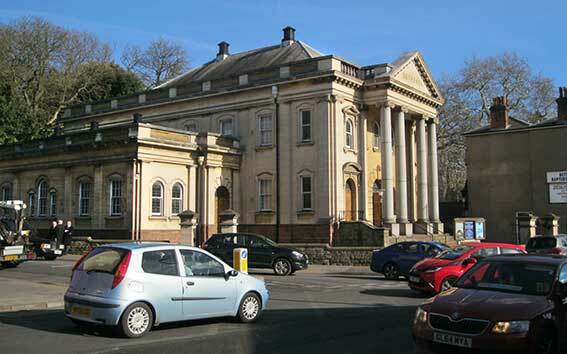 The building dates from 1913 and was funded by Mr Arthur Page, a Bristol lawyer, as a memorial to his mother who died in 1911 at the age of eighty-two and the architect was F.G. Faunch. Bethesda was originally the name of a pool in Jerusalem, on the path of the Beth Zeta Valley, and is also known as the Sheep Pool. It is associated with healing. The building stands opposite the Egerton and Halberd signs and Northgate Street. 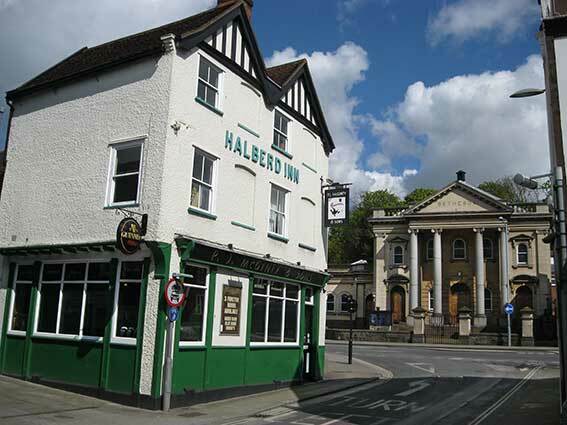 Below: the view across the junction from outside The Halberd shows a typical view of much traffic around this handsome building. Above: the Betehsda Church in the background, across St Margarets Plain, with the 'Halberd Inn' lettering in the foreground on Northgate Street; see our Egertons page for more on this. 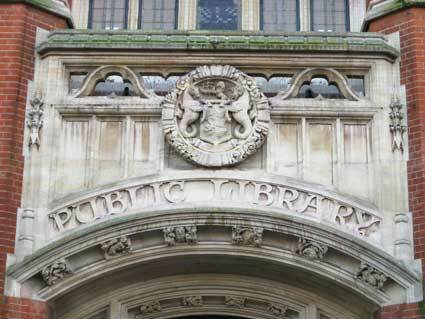 A more intriguing letterface appears above the Northgate Street entrance to the County Library. This wonderfully eclectic Victorian frontage with its arches and stained glass boasts an imposing entrance. Beneath the false balcony is a circular moulded crest (see also Ipswich Board School in Argyle Street - the close-up below surely shows sea horses rampant supporting the town shield?) and below that the serif'd letterface in capitals which seems to blend medieval and art noveau influences. Given Chaucer's presence in the stained glass and the traditions upon which William Morris's Arts & Crafts Movement were based, that's about right. Henry Munro Cautley was the architect responsible for the rather fine frontage. Truly the entrance to a cathedral of knowledge, learning and reading, the gently curving lettering above the door says it all. 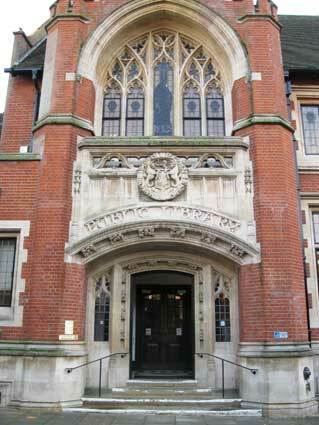 The refurbishment of this fascia accompanied a major extension of the library buildings in the mid-nineties. The curved and decorative ceilings and fine stained glass (principally in the Lecture Hall and Reference Library's Northgate Room) have been preserved. For other buildings with the Ipswich coat of arms click here. 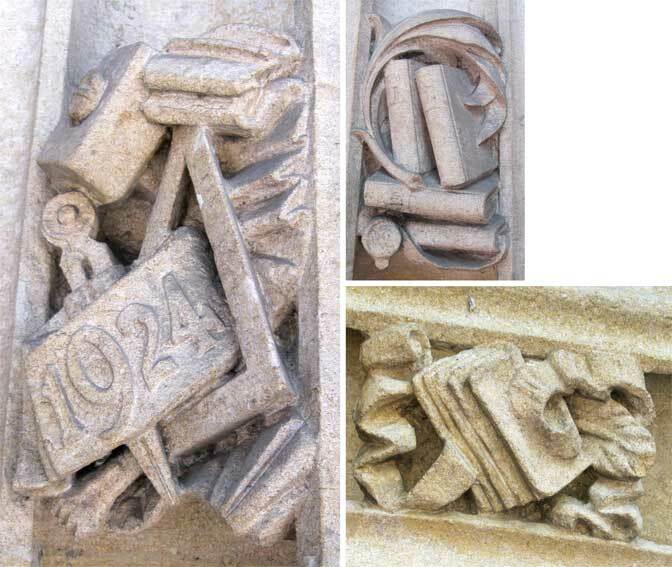 The photographs below show details of the stonework around the entrance. It wasn't until we noticed the '1924' image on a library web page run by Jonathan Clift, that we though that we ought to pay a little more attention. The dated motif is surrounded by stonemason's paraphernalia (mallet, dividers, chisel, set square) with bookish carvings opposite and the pages and quill pen surrounded by scrollwork above. "The main panel is set between the turrets framing the northern gabled entrance to the Library and above the doorway. 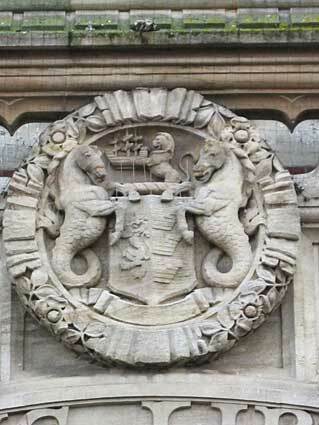 Ipswich's coat of arms is held by two wyverns. The arch above the doorway is filled with decoration. In the centre are books with a bookmark showing a crown. 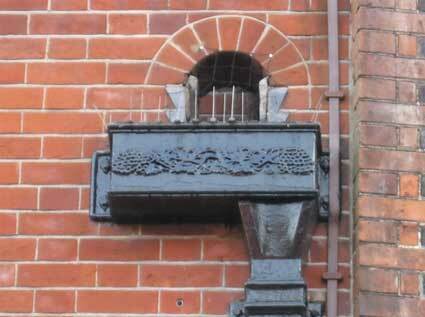 Other niches include an owl (famed for its wisdom) a squirrel eating a nut (storing information) and on the left a snake with an apple (the temptation of knowledge); to the right they continue with two water-rats and rabbit nibbling. The theme is continued in the carving of the door frame with another set of books in the centre flanked by a fish, frog, parrot, monkey and architect's set square with cartouche dated on 1924 on one side and a bird and fish on the other. The brick buttresses are decorated with bronze roundels with lion heads. The Library, built at the modest cost of £32,000, aimed at a Collegiate effect with its Gothic windows, oak bookcases and plaster ornaments. The detailed decoration ranges from references to books and knowledge to display of the wild life and the exotic which could be researched there." Much more on the story of the public library service in Ipswich and the building of this Carnegie Library can be found on our Rosehill case study page. 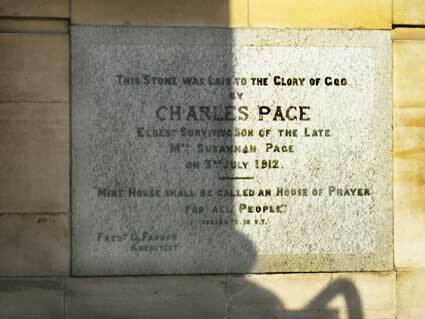 Directly opposite the Public Library stands Archdeacon Pykenham's Gatehouse which is illustrated on our plaques page. 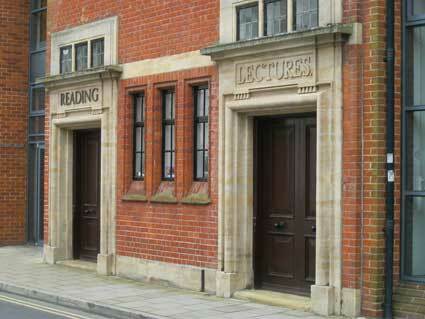 Meanwhile, hiding round the corner in Old Foundry Road (opposite Ewers Grey-Green Coaches) are the 'Reading' and 'Lectures' entrances to the Library's Reading Rooms and Lecture Hall with attractive typefaces used on the lintels of these (now) false doorways - the entrance since refurbishment is just visible to the left of the photograph below. So, why has one got screwed-on characters and the other carved characters (repleat with full stop: always an oddity in old signs)? Old Foundry Road runs from Northgate Street to Carr Street and was once called St Margaret's Ditches as it formed part of the old town's defensive ramparts. Robert Ransome acquired premises in this street for his foundry, which operated here until the move to the Orwell Works completed in 1849. The Old Foundry gave a new name to the street. Until the 1930s there were still houses here built on the top of the earthen rampart and approached by steps from the road. See our Blue plaques page for detail relating to Robert Ransome. The crisp, elegant serif'd capitals are particular satisfying here with the depth of the relief carving particularly noticeable on the full stop unnecessarily, but rather joyfully, appended to the name. Hiding in the shadows of the roof overhang on the front of the largest live venue in East Anglia, we find 'THE REGENT' in St Helens Street. Partially restored in the eighties (and more fully later), it's certainly a cleaner fascade now, the lettering more readable. For many years this was called The Gaumont Cinema (plus a small dancehall), live music and drama being slotted between the film shows. All those years with hardly anyone noticing the lettering of the original name, reverted to since restoration, high above the entrance. picked out by the setting sun in March 2004. The clean clear capitals have a typically Art Deco feel, but shouldn't that 'G' have more of a middle bar? It reads more like 'Recent'. The tapering, anti-clockwise design of the 'G' is intriguing. It looks as if one vertical support, to the left of the first 'T', and the marks left by three others were still in place in 2004 – they would have supported a covering board for different lettering. Above: a picture from the 1950s or 1960s when a 'GAUMONT' sign covered the lettering. There seems to have been a lamp to illuminate the Gaumont sign attached to the 'keystone' of the central window; a metal plate is still visible here in the 2014 photograph. The Regent is an important Art Deco building, designed in 1929 by classic theatre architect William Edward Trent for Provincial Cinematograph Theatres as a 'cine-variety hall' and was among the first UK theatres to play films with sound. So, a large venue designed as a cinema, with the capacity to stage theatrical performances. It was extremely luxurious, with a restaurant, 14 boxes, a resident Wurlitzer organ and organist and an 18-piece orchestra. A huge Regent Cinema, built by the same company, was opened in 1921 in Brighton which was demolished in 1974. 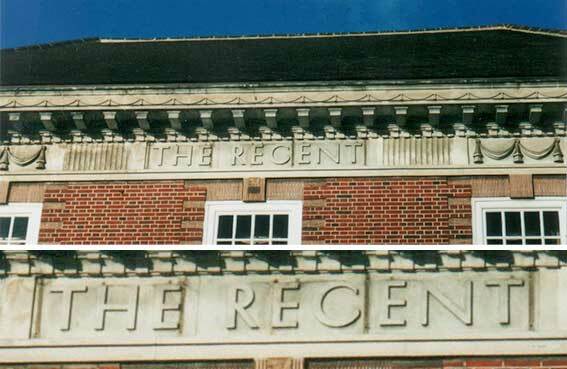 Above: the Regent with 'ODEON' lettering on the upper panel and on each side of the entrance canopy in the familiar font; The photograph is from the Ipswich Society Image Archive (see Links). During World War II the theatre was used to stage concerts and civic events, as well as ballet and opera. In the 1950s the name changed to the Gaumont and it hosted many top acts including Buddy Holly and the Crickets, the Beatles. Gene Pitney, the Hollies, the Small Faces, Roy Orbison, the Walker Brothers and the Jimi Hendrix Experience. In the 1970s and 1980s it hosted many punk and new wave acts including Ian Dury and the Blockheads, Elvis Costello and the Attractions, the Stranglers, Siouxsie and the Banshees and the Boomtown Rats. The building then took on the name Odeon in its last years as a cinema. Following its closure, Ipswich Borough Council took the theatre on following controversy over its future, reopening it as The Regent Theatre on 21 September 1991. It was Listed Grade II in 2000. In 2009 The Regent Theatre celebrated its 80th birthday with a gala concert featuring Lesley Garrett and the Royal Philharmonic Orchestra. At the time of this photograph, the billboard advertises Phase One of 'East Anglia's Premier Entertainment Venue' with a Five Screen Cinema. The faux-deco Odeon cinema complex was built near the tip of Majors Corner but struggled to attract patrons and was put out of business by the competition from the Virgin multiplex in Cardinal Park (off Commercial Road – now Grafton Way). 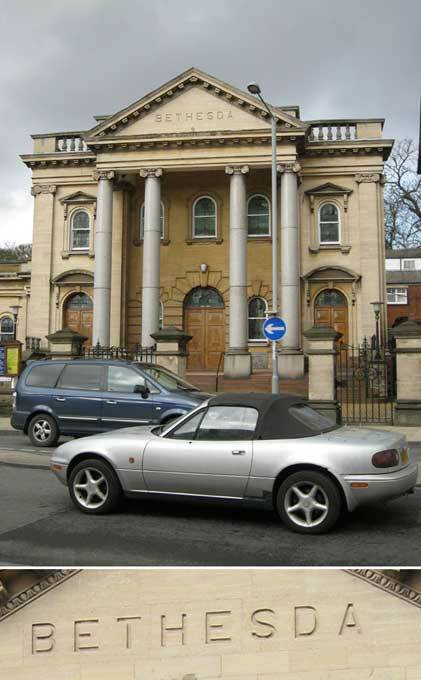 In 2018 it appears that it might become a venue for the Hope Church. Odeon is the name for several ancient Greek and Roman buildings built for music: singing exercises, musical shows or poetry competitions. The word comes from the Ancient Greek Ōideion, literally ‘singing place’, or ‘building for musical competitions’; from the verb aeidō, ‘I sing’. The Gaumont-British Picture Corporation was a company founded in 1898 as the British subsidiary of the French Gaumont Film Company; it produced and distributed films and operated a cinema chain in Britain. The latter was founded by the engineer-turned-inventor Léon Gaumont (1864-1946), in 1895; it is the first and oldest film company in the world. Regent is a role in the British monarchy, notably of the Prince Regent, later George IV, giving rise to many terms such as ‘Regency era’ and ‘Regency architecture’. 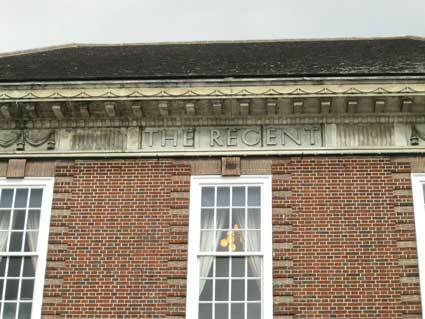 Although neither apply to the Ipswich building, it is likely that the name ‘Regent’ was chosen to give the ring of quality to the theatre – similar to the use of ‘Regal Cinema’ in other examples. 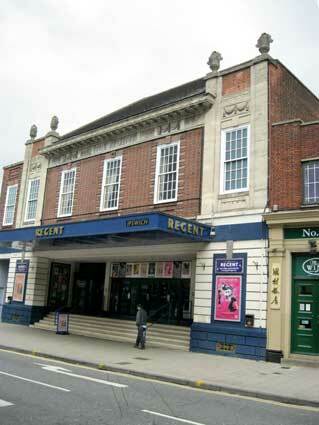 The Regent Theatre Ipswich opened in 1929 as a cine-variety hall. At 7.00pm on Monday November 4th, the entrance doors of the new Regent, Ipswich opened and into its spacious foyer crowded nearly 2,000 Ipswich people who had come to witness this momentous occasion. Outside the theatre a large queue had formed, filing past Botwoods Garage. As a Ransomes steam lorry tooted its whistle, the staff of the Regent lined up for their first inspection by the manager, Albert E. Crabb who checked their 'electric' torches. On the stage, the Mayor of Ipswich, Dr Hossack, performed the opening ceremony; musical numbers were played on the brand new Wurlitzer organ by the resident organist Frank Newman F.R.C.O. that included the Merry Wives of Windsor by Otto Nicolai. The film chosen to open the venue then began - "The Last of Mrs Cheyney" starring Norma Shearer and Basil Rathbone - an 'all-talking' picture with front circle seats costing 2s / 4d. The luxurious Regent restaurant enhanced a visit to the theatre and, if desired, tea could be served in any of the fourteen boxes at the rear of the stalls. The boxes and the Manager's cottage at the rear of the theatre are unique features of the Regent. Before World War II, the stage was not used to any great extent, although up to the mid-1930's, the 18 piece Regent Orchestra, under the direction of Louis Baxter frequently entertained the audiences. Most theatre orchestras were disbanded in the late 1930's and the organ then became the principal musical attraction. During the war the Regent provided much needed escapism and helped sustain public morale. After the war, The Regent flourished and enjoyed an attendance boom. 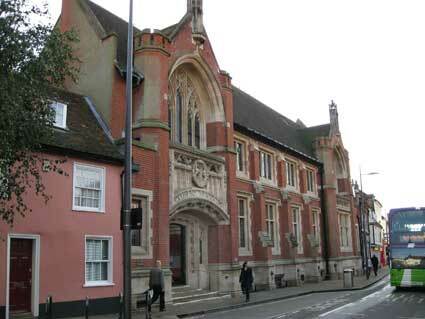 Also during this period, the stage was employed in the presentation of Ipswich Civic Concerts. The stage was also used for the presentation of Sadler's Wells Ballet, Carl Rosa Opera and one-night band shows. The popularity of cinema in the 1930's and 40's was so great that another cinema in Ipswich, The Ritz, was opened in 1937. But the advent of television in the 1950's proved a testing time for cinemas up and down the country and even the highly successful Regent, by now known as the Gaumont, did not survive intact. To allow the cinema to become more profitable, the restaurant was closed down and replaced by the Victor Sylvester Dance Studio. In the late 1950's the 'pop' music phenomenon exploded. Buddy Holly and the Crickets started off the craze at the Gaumont and since then thousands of international artists have graced the theatre's stage including the Beatles, Tina Turner, The Bay City Rollers, Tom Jones, Chris Rea, Status Quo and many of today's top artistes. From 1958, local musicians and dramatic societies were encouraged to perform at East Anglia's largest theatre. 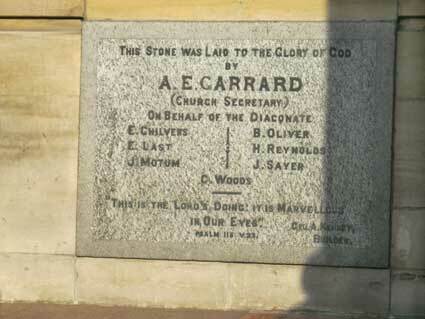 These included the Ipswich Operatic Society, the Gilbert and Sullivan Society and later the Co-op Juniors. The programme has since included a wide range of productions including professional touring theatre, opera, ballet, comedy and full-scale orchestras. By 1965 the proprietors, The Rank Organisation, were sufficiently confident of the future to spend £50,000 on a major modernisation and redecoration programme. But by the 1970's, the large cinemas that had been so successful in the 30's and 40's proved to be less economically viable. The Gaumont's dance studio was converted to a luxury 200-seat cinema, which could be rented out for use by the local business community. Rank also proposed to convert the main auditorium to a multi-screen complex. However, after a great deal of persuasion, Rank's plans were abandoned because the auditorium was established as the only local venue of sufficient capacity to stage live shows and concerts despite its limited performance facilities. The theatre was re-launched in September 1991 after Ipswich Borough Council successfully negotiated the ownership from the Rank Organisation and NCP. Today, Ipswich Borough Council continues to fund the theatre as part of its arts and entertainment portfolio which also includes the Corn Exchange and Ipswich Film Theatre. Dial Lane was 'Cook Row' and St Lawrence Street was 'Fruit Market'. 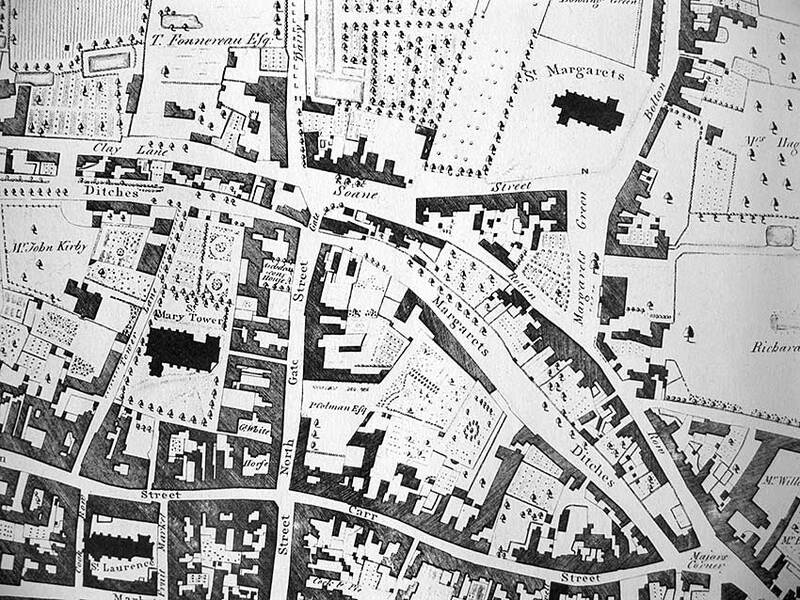 Great Colman Street did not exist, but the land ownership off Northgate Street is indicated as 'P. Colman Esq' (see Street name derivations). 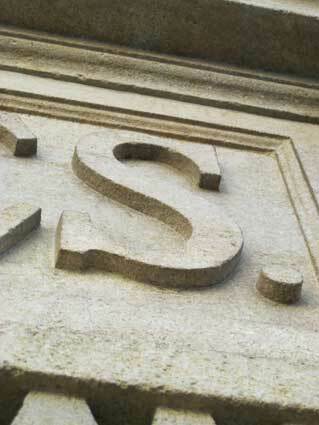 For more lettering examples in St Helens Street try County Hall, IBH, H.W. Turner, Tramway Place and Hales Chemist. 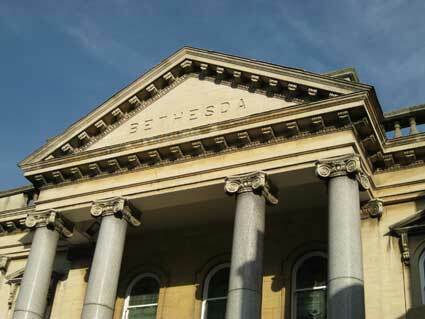 See our Named buildings page for more specific examples. See also our Dated buildings page for a chronological list of dated buildings and structures on this website; our Roundwood Road page has specific examples of named/dated buildings.